May 13, 2015, 4:48 PM · Knott's Berry Farm this morning unveiled its new 3D dark ride, Voyage to the Iron Reef. A four-minute interactive experience from TrioTech, Voyage to the Iron Reef allows riders to play by blasting steampunk-inspired sea monsters that have been attacking the park, dragging some of its past icons to a watery grave. You've been challenge by Captain McAllister to board one of his new "submarines" to freeze blast the sea creatures before they can attack the park again. It's a fun premise that essentially gives developers an excuse to sprinkle images of past Knott's landmarks throughout the ride. Yet I found myself wondering if perhaps we should stop attacking these attraction-munching demons and instead just dive below to give them a stack of annual passes to other parks around the country, along with a to-do list. Alas, I am a salty soldier, aren't I? Let's get to the game. Voyage to the Iron Reef carries us under the sea with an impressively decorated mix of practical sets and 3D screens. All of the game play happens on 10 of the 11 3D screens in the ride. You have up to three others in your four-person ride vehicle, and although there's no explicit competition between you, bragging rights always are in play. Just as the Captain guides us below the surface, the voice of the Kraken Queen warns us that we will never emerge from the depths again. And with that, the battle is on, as crabs, eels, puffer fish and other monsters under the Kraken Queen's command begin their attack on our ship. You'll want to aim first for the four-pointed-star medallions you'll find at the start of each scene. They'll score bonus points and appear to be key in helping you get the highest possible scores in each scene. Beyond that, fire away. You'll need to pull the trigger for each shot (no automatic firing) and make note which color of freeze-ray blast corresponds to your gun. (Each of the four guns blasts a different color.) That will help you dial into the targets. There are too many targets on the 10 screens to account for them all here, after just three rides today. Clearly, this is an attraction that will reward visitors for riding again and again. (My score went up with each new attempt.) A few tips I picked up: Aim for the targets inside the claws on the arms of the octopus, and the giant puffer fish puff up with each shot before exploding after the high-paying kill shot. But the biggest score awaits you in the finale, when you come face to face with the Kraken Queen. Aim for the weapons she launches at you before your fellow riders can, for whoever blasts them first gets the big points. With Voyage to the Iron Reef, Knott's adds to its collection of attractions that should appeal to theme park fans looking for more than your basic regional iron park. 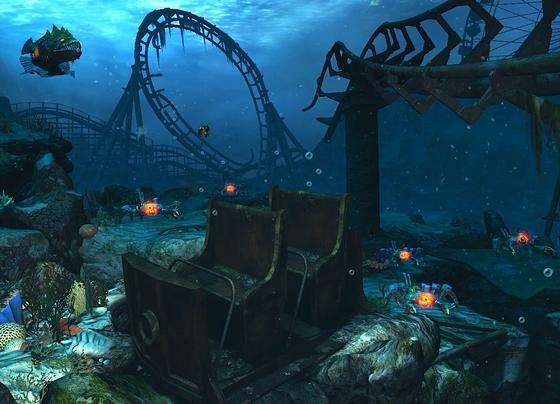 A visually stunning experience, Iron Reef offers rewarding game play in a rich environment that should appeal to visitors looking for a shooter ride less "cartoony" than Disney's Buzz Lightyear and Toy Story Midway Mania. 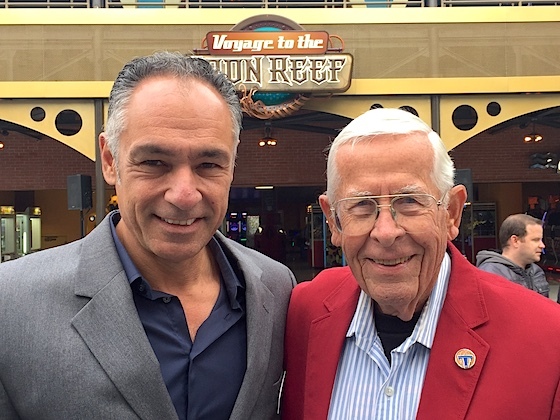 Knott's GM Raffi Kaprelyan, with Disney Legend Bob Gurr. Gurr worked on the "Kingdom of the Dinosaurs" attraction that once stood in the Voyage to the Iron Reef building, and introduced the new ride at this morning's dedication. Along with the Timber Mountain Log Ride, Calico Mine Ride, and Mystery Lodge, Knott's now offers four attractions that would fit well down the street at Disneyland, or any world-class theme park, plus a well-decorated Camp Snoopy children's area where kids can play on their own scale. General Manager Raffi Kaprelyan hinted in his opening remarks at the Iron Reef dedication this morning that next year's new/improved ride will be in the park's Ghost Town land, to celebrate its 75th anniversary in 2016. Perhaps a fifth world-class attraction might be joining the Knott's line-up soon. May 13, 2015 at 5:06 PM · Ah, the advantage of media day access. I rode three times, with no more than a five minute wait, before the park was opened to the public. Knott's is saying that the hourly capacity of Voyage to the Iron Reef is 800 riders, so that's likely going to lead to significant waits in the first few months that the ride is open, though the capacity and continual loading should help make this a much more manageable wait over the long term. May 13, 2015 at 5:59 PM · Did anyone else notice the "Tomorrowland" lapel pin on Bob Gurr? May 13, 2015 at 6:32 PM · I was there today as well and rode first thing in the morning (waited just over an hour). The ride really impressed me. I was expecting something similar to the Sally shooters but with screens, however Voyage to the Iron Reef is absolutely a Disney-caliber attraction. I'd even say it's better as a dark ride than Toy Story Midway Mania (though Toy Story Midway Mania is more fun). I'd hold off on visiting the park just yet as the ride still seems to be having some technical issues (although I did get a second ride due to this), but with this and Calico Mine Ride (and Timber Mountain Log Ride, though I don't quite count that as a dark ride) Knott's has become a must-visit park for dark ride fanatics on a Southern California trip. May 13, 2015 at 6:49 PM · The ride looks awesome. I love interactive rides. May 13, 2015 at 7:42 PM · Kudos to Knotts and Cedar Fair for leading the charge in bringing back dark rides to regional parks. Please tell me Worlds of Fun is next, Cedar Fair, please! May 13, 2015 at 8:41 PM · Really love what Cedar Fair has been doing these past few years. Excited to visit Knott's the next time I'm in California. This ride, the refurbished classics, and the charming Ghost Town, make this a gem of a park. May 13, 2015 at 11:02 PM · I got to experience the attraction today during the previews, and it was an hour wait. I enjoyed the attraction while I was on it but the line was brutal. It didn't have that connection for me with the preshow - probably because the introduction video was all over the waiting area, queue and was on a constant loop. I think it would have been better with more detail to the queue and a separate viewing area for the preshow video. May 14, 2015 at 8:47 AM · Looks like a great ride from the Youtube videos. I also enjoyed viewing the pre-show. It has a catchy score, very atmospheric. I'm not sure it is worth making a trip just for that ride, but it adds a lot to the park. The park looks terrific from all the new additions. I still think they should do a year round tame Haunt attraction as a ride. Why should Disney get all the great attractions? Knott's is just as good. Rumors are Knott's will get an Iron Ghost Rider makeover like the Six Flags Magic Mountain Twisted Colossus. May 14, 2015 at 2:15 PM · Hope this is a sign of things to come at the other CF parks. They hint next year Carowinds will get a "splash"... maybe a water park redo is too obvious and could actually be something like this??? May 14, 2015 at 6:49 PM · Iron Ghost Rider? That would be interesting... My only problem with that is that GhostRider is way too small and I think part of the thrill of the ride is that its rough. By making it steel, I worry that it may be boring. May 15, 2015 at 2:54 PM · I didn't understand so much that finale, something happen besides this little chase? May 16, 2015 at 5:59 AM · Yes I also starred at the Pin, but figured out just reading your Comment what Pin it is..